We really just want our customers to be happy and find what they need the first time around. 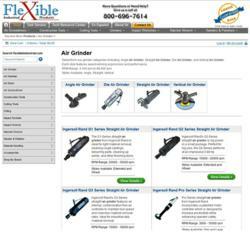 FlexibleIndustrial.com, launched in February of this year, has created a new shopping category for customers titled “Air Grinder”. The category focuses on the sale of industrial grade air grinders used for professionals in the industrial and manufacturing environment. Representing the best industrial tools in the business, Flexible Industrial now makes it even easier to locate your desired air grinder from Ingersoll Rand, Atlas Copco, URYU, CP, and Sioux Tools. By adding the Air Grinder category to an already wide selection of products on FlexibleIndustrial.com, the user can quickly find what they are looking for with the click of a mouse. Flexible Industrial Products, a division of Flexible Assembly Systems Inc., is headquartered in San Diego and is a leading international distributor and supplier of industrial tools and products. Companies worldwide have turned to Flexible for help in meeting their industrial production needs. If your company is in need of impact tools, air screwdrivers, air grinders, drills, ratchets, cutting tools, hoist & Winches, or service and support on existing equipment, let the experienced and knowledgeable staff at Flexible help you.